Horse Racing Manager 2018 : Become the number one horse racing manager to grace the tracks! Race, train, breed from the local derby to the Ultimate Championship. Compete against other jockeys online from around the globe and compete in new events daily! Compete in the local derby, circuit, or cup to earn rewards and work your way toward the Ultimate Championship. Watch intense and suspenseful races just like the real spectator sport or skip ahead to get back to business. Play through a realistic and immersive calendar of races. Cross the finish line for a realistic photo finish. 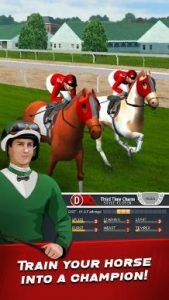 Stunning 3D visuals make Horse • Racing Manager 2018 the best virtual horse racing simulation experience around! Manage a robust and efficient stable to raise the fiercest of thoroughbreds. Boost horse performance stats with food, rest and physical training. Improve and upgrade stats through a variety of training methods or breed horses to create the strongest bloodlines. Strategize routines that can vary in surface conditions, exertion levels and more. Maintain peak performance. Only the best race horse owners know how to keep their horses well rested, at an optimal weight, and race ready. Pack a few pounds on with some sugary treats. Try feeding your horse a handful of sugar cubes! Unlock additional stable slots to bolster an even more impressive roster of horse racing stars. Buy, sell and breed horses to participate competitions and create a powerhouse stable full of speedy candidates. Match two horses with favorable traits to inherit special attributes and stats. Carefully breed unique skills that can only be obtained through breeding, and not training. Engage in events that can affect special Breeding Rights. 3D visuals showcase an impressive variety of unique colors, patterns, and traits acquired through breeding. Choose a unique look for your jockey and horse with an assortment options. Adjust the outfits, emblems, and colors to suit your own personal taste. Bond with every horse in your stable by giving them individual names. Experiment with Breeding Rights to produce a foal with special physical traits. Create a nurturing environment for your horses to flourish! PLEASE NOTE! Horse Racing Manager 2018 is free to play, but it contains items that can be purchased for real money. I love to train my for the race but rest him as well love the feel of game.